Westfield Augers (Australia) Pty Ltd introduces the new MKX 16” auger available in 85’, 105’ and 125’ lengths with capacity over 23,000 BPH. Considered one of the highest capacity augers in the market, the new range has been designed utilising Westfield’s world-class manufacturing facility and highly skilled research and development team. Designed carefully to meet the needs of demanding large farm and commercial operators, the new MKX160 Series augers are built to last from the engineered top truss for added strength and stability, to a long list of standard features. 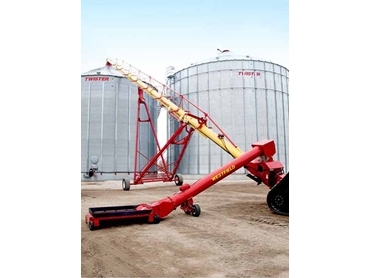 The Westfield MKX160, by ensuring quick and easy turnaround is particularly useful during harvest when unloading the grain is top priority for farm operators. Key features of Westfield’s MKX160 Series augers include a low profile hopper only 11¾ inches high with triple flighting, featuring Westfield’s industry leading Wear Edge technology for long lasting, reliable performance; 16-inch augers supplied complete with a CV PTO 1000 rpm reducer reverser, remote electric power swing and hydraulic winch for simple setup; square flight connections on the low profile hopper; double intake flight for better grain flow; sealed flex spout and chain coupler on the swing head for long lasting performance; clear access panel, large booth for increased capacity, external grease zerk, and removable slip-on boot flight on the boot.